Just six months after the introduction of the K-S1, Pentax introduced an even fuller-featured mid-range DSLR. 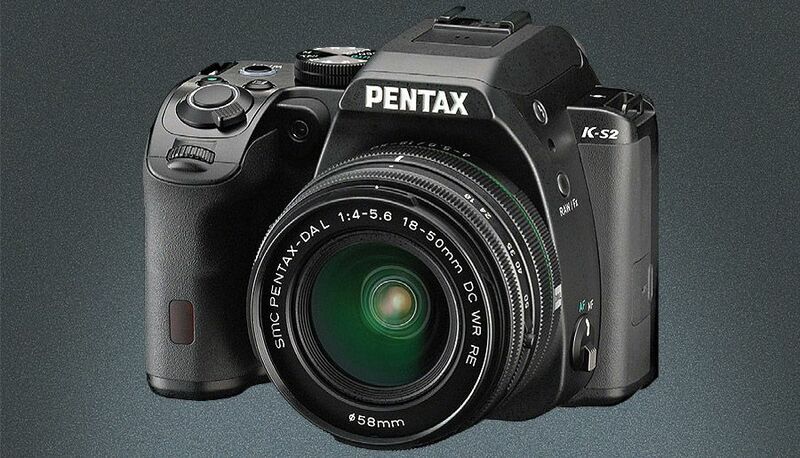 The K-S2 offers many of the K-S1’s assets and adds the first articulated LCD panel in a Pentax DSLR, along with the first built-in WiFi (with NFC for easy connection), for wireless transfer of images and remote camera operation via your smartphone or tablet. Retained from the K-S1 (which remains in the lineup) are the 20.1-megapixel APS-C CMOS image sensor with no anti-aliasing filter (and the AA-filter simulator introduced in the flagship K-3), a fast PRIME MII imaging engine, ISO settings from 100-51,200, 11-point AF, 77-segment multi-pattern metering, in-body sensor-shift shake reduction that works with all lenses, shutter speeds up to 1/6000, 1080 Full HD video at 30/25/24 fps with stereo sound via built-in microphone, and dustproof, weather-resistant body. The K-S2 can shoot up to 5.5 fps, and adds a Clarity Enhancement feature that delivers more realistic textures—it’s automatically applied when you activate the new A-HDR mode. Despite its compact size, the K-S2 features a glass pentaprism finder that shows approximately 100% of the actual image area, with a 0.95X magnification factor. (Pentaprism finders are brighter than the pentamirror types usually found on DSLRs in this price range.) There’s also a built-in popup flash unit. The camera can compensate for lens distortion, chromatic aberration, peripheral brightness (vignetting) and diffraction. Like all Pentax DSLRs, the K-S2 can use just about any Pentax SLR/DSLR lens, including (via adapter) old screw-mount models and Pentax medium-format lenses. Current DSLR lenses range from 10-17mm fish-eye zoom and 14mm ƒ/2.8 superwide-angle to 560mm ƒ/5.6 supertelephoto, plus a 1.4X tele-converter. In-body sensor-shift Shake Reduction provides stabilization with all lenses. Dimensions are 4.8×3.6×2.6 inches and weight is 21.7 ounces (body only). Contact: Ricoh Imaging, www.us.ricoh-imaging.com.